Knocking through a few rooms to create a large open-plan area, the owners of this sleek kitchen wanted to create a free, fluid space that made the kitchen the unequivocal hub of the home whilst at the same time stylistically linking to the rest of the property. We were tasked with creating a large open-plan kitchen and dining area that also leads through to a cosy snug, ideal for relaxing after a hard afternoon over the Aga!! The owners gave us creative control in the space, so with a loose rein and a clear head we fashioned a faultless kitchen complete with a large central island, a sunken sink and Quooker tap. 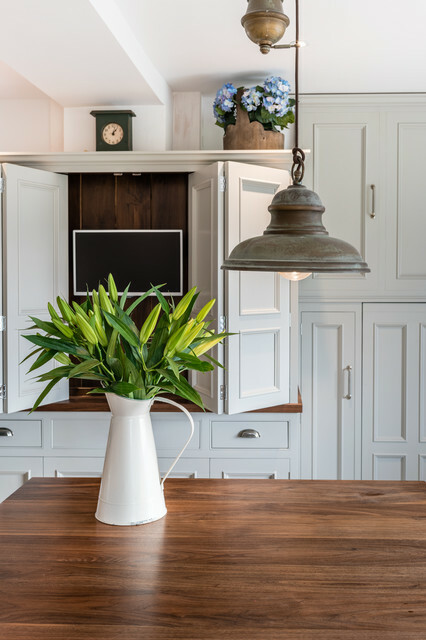 For optimum storage (and a dash of style) we built a number of large larders, one of which cleverly conceals a television, as well as a false chimney surround to frame the Aga and a bespoke drinks unit. All the units are hand-crafted from Quebec Yellow Timber and hand-painted in Zoffany ‘Smoke’ and ‘Elephant Gray’ Walnut worktops, with Silestone ‘Lagoon’ Worktops around the outside and American Black Walnut on the island. Where did you purchase the lights? How was the walnut countertop finished? I like the sheen on it. - I finished my cherry countertop with a linseed oil finish, but now am unable to purchase the same oil. I wondered if I should sand it and refinish it with another product. I do not chop on the surface. Thank you. Hi, we use OSMO oil in the 'clear, satin matt' finish. I don't have any experience with linseed oil but cannot recommend OSMO enough. What paint color is used on the wall in the kitchen? what is the counter top called? Walls - What are the wall colors in this fabulous space please? Love the hidden tv and how the wall behind the tv is darker to match the butcher block and presumably the flooring.